The Gold Coast is Australia’s premier beach holiday spot, with picture perfect beaches, abundant attractions, great shopping and dining. There are plenty of fantastic accommodation options on offer, discover and book a hotel in Gold Coast. Away from the glitz and glamour of the Gold Coast’s busy strip of beachside high rises, the area is also blessed to be surrounded by stunning natural scenery, with world class beaches on one side, and rainforest clad mountains on the other. For nature lovers, the Gold Coast has a lot to offer, and these beautiful natural areas provide some great hiking spots to explore Australia. There are hikes ranging from short strolls for beginners to tough treks for advanced hikers. When you’re packing for your next Gold Coast holiday, don’t forget to pack your hiking boots and head to one of these excellent hiking spots. 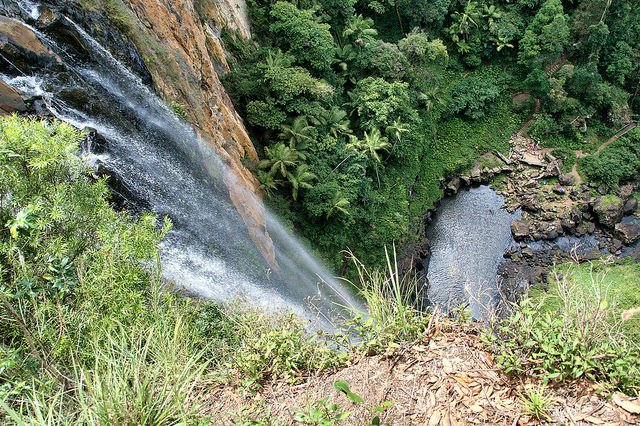 Located in the Gold Coast’s lush hinterland, Springbrook National Park is one of the most easily accessible areas of rugged, natural rainforest mountain scenery. There are three different sections to the park and each has its own highlights. You’ll find lush rainforest, spectacular waterfalls and refreshing swimming holes to cool off in. Hikes range from short rainforest strolls to tough mountain treks. This 4km loop in the Springbrook Plateau area of the park is one of the must-do walks in the area. The trail leads through forest to the top of the spectacular Purling Brook Falls. Take the walk to the bottom of the falls and cool off in the refreshing pool. A trail heads downstream from here for around 1km to the Warringa Pool, another nice spot for a dip. A scenic one hour’s drive inland from the Gold Coast will bring you to the Natural Bridge section of Springbrook National Park. The Natural Bridge is one of the most popular natural attractions in the Gold Coast Hinterland, where a tranquil rainforest stream tumbles down below a natural stone archway. The 1km return loop of the Natural Bridge Circuit takes you through lush subtropical rainforest and down into the gorge that the stream plunges into, and then up the other side where you can see the arch from above. Below the arch is a natural cave, which at night is illuminated by thousands of glow worms. The Cougal section of Springbrook National Park sits on the border with New South Wales. For advanced hikers, the tough 10km trek along the border fence to the summit of Mount Cougal is well worth it for the stunning views and the challenging terrain. If you’re a beginner, enjoy the short walk to Cougal Cascades and cool off in the refreshing water. 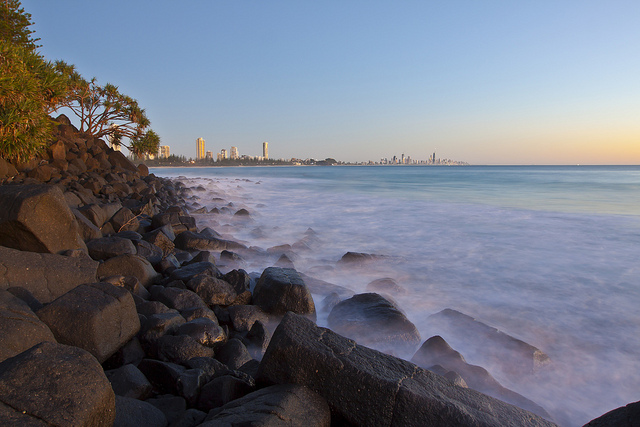 Burleigh Heads is one of the hippest beachside suburbs on the Gold Coast, and one of the best surf spots. The rocky headland that juts out into the water is designated as national park and provides a popular spot for a waterfront stroll. The lower track is a nice easy walk around the headland, starting at Burleigh beach and meandering around to Tallebudgera Creek. The coastal scenery is beautiful, and Tallebudgera Creek is a nice sheltered spot for swimming, snorkelling and stand up paddle boarding, with lots of sand and crystal-clear water. The upper walking track climbs to the top of Burleigh Headland to Tumgun Lookout, providing some of the best views you can get of the Gold Coast, stretching north past Burleigh Heads to the skyscrapers of Surfers Paradise, and South across Tallebudgera Creek to Miami. During the whale watching season you might even spot a Humpback Whale or two making their way along the coast. There are many reasons to visit Mount Tamborine while you are on the Gold Coast. In just a short drive you can enjoy cool mountain air, rainforest, art galleries, cafes, vineyards and amazing views of the Gold Coast. This interesting area is also home to some beautiful nature reserves, making it a wonderful place for hiking. Mount Tamborine National Park is made up of several sections, one of which is the Witches Falls section of the park, declared in 1908, making it the first National Park in Queensland. The Witches Falls Circuit is a 3.6km loop that makes its way down a slope to a beautiful patch of rainforest, filled with piccabeen palms and huge strangler figs. The Curtis Falls Track is in the Joalah Section of the park, right in the heart of Mount Tamborine. 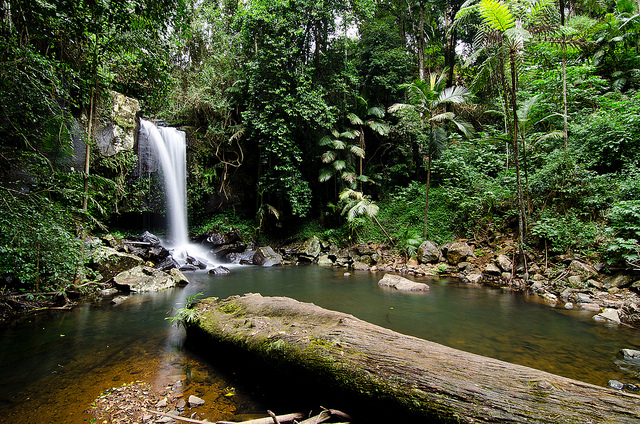 The track is a nice easy stroll through lush rainforest to the picturesque Curtis Falls and rock pool. For a longer walk, combine it with the Lower Creek Track that follows the creek through the rainforest in a 2.5km loop. 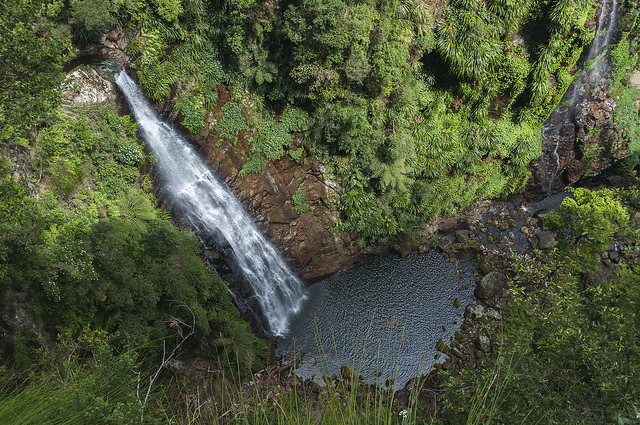 Another nice waterfall to visit on Mount Tamborine is Cedar Creek Falls, an easy 500m stroll to the waterfall lookout. A track then leads down to the rock pools below, perfect for cooling off on a hot day. 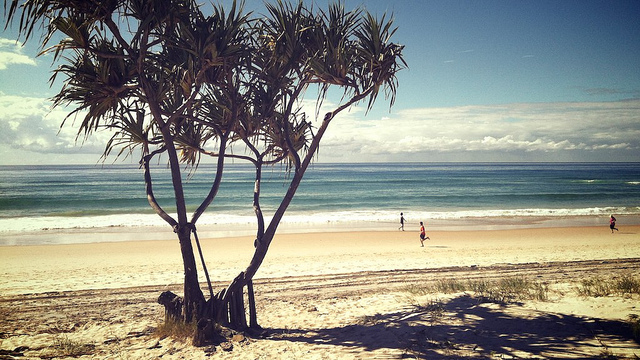 If you’re looking for a nice coastal walk on the Gold Coast, the 7km Federation Walk is for you. The walk starts at the popular Main Beach and follows along the sandy stretch of land known as The Spit. Enjoy walking amongst the coastal flora of the sand dunes with the ever-present Pacific Ocean on your right-hand side. The great thing about this walk is that you can head straight down onto the beach whenever you feel like it, so you can split up your walk with a few dips in the ocean. Lamington National Park is a large park situated on a plateau covered in lush rainforest, with a dramatic escarpment dropping down to the New South Wales Border. The closest section of the park is Binna Burra, which can be reached in about an hour’s drive. Lamington National Park is a nature hiker’s dream, with stunning, seemingly untouched rainforest, criss-crossed by a huge network of trails. The Coomera Circuit is one of the most scenic walks in Lamington National Park. The circuit is a full day hike of 17km, starting at Binna Burra and meandering through lush rainforest to the dramatic Coomera Falls, which plunges down into the gorge below. The trail then follows the picturesque Coomera River upstream, crossing many times where there are more waterfalls and lush rainforest, before looping back around to the main access track. This 11km trail begins in the Green Mountains Section of Lamington National Park, and features some huge brush box trees, which have been known to reach 1,500 years old in the park. These giants are the oldest known trees on the Australian mainland, and are a sight to behold. 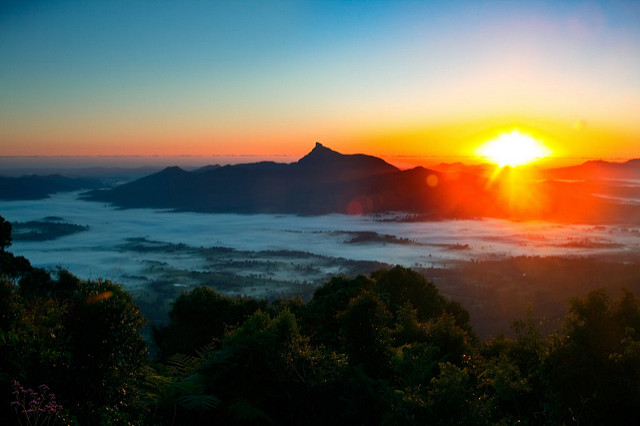 Although situated in Northern New South Wales, Mount Warning can easily be reached from the Gold Coast. The mountain is essentially the plug of an enormous extinct volcano, and dominates the view where ever you are in the area. The challenging hike to the summit of Mount Warning is an 8.8km climb which can take anywhere from 5 to 8 hours return, depending on your fitness level. The views from the top are well worth the climb, with sweeping views across to the Gold Coast and Byron Bay. As you can see, the Gold Coast is full of excellent places to go hiking, and these are only a few of the trails on offer. So, on your next trip to the Gold Coast, don’t forget to pack your hiking boots.